Covering an area ten miles by ten miles, Bodmin Moor is an area of bleak but beautiful granite moorland. Designated as an Area of Outstanding Natural Beauty it is the source of many rivers including the River Fowey. Originally forest land, mankind started clearing the land 10,000 years ago and by the Bronze Age most of the forest had been cleared. Remnants of fields, farms, megalithic chambers, burial places, stone rows, circles and standing stones all survive forming a wealth of archaeological remains. Evidence of man's later activity can be seen in the eastern end of the Moor with the 18th Century ruins of tin and copper mining. These ruins centre on the village of Minions and around the area of Caradon Hill, the site of a present day television mast. About half-a-mile west of Minions lies The Hurlers, a group of three stone circles. Just to the west of the circles are two standing stones known as the Pipers. This is a close grouping of three Late Neolithic or Early Bronze Age regular stone circles and, as such, is unique in England. All of Bodmin Moor is privately owned by landowners known as the 'Lords of the Manor' and, unlike Dartmoor, the moor is without many Public Rights of Way. 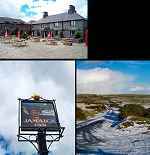 At the centre of Bodmin Moor lies the village of Bolventor in which you will find "Jamaica Inn". Cornwall's highest peaks, Brown Willy and Roughtor, lie to the north and Dozmary Pool to the south of Bolventor.